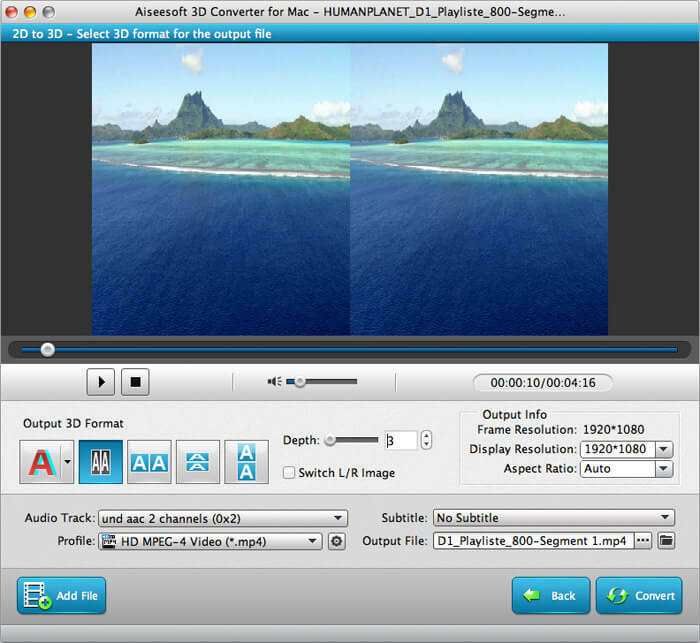 Aiseesoft 3D Converter for Mac 6.5.12 Free Download - It is one full-featured 2D to 3D, 3D to 2D, 3D to 3D video converter for Mac. Aiseesoft 3D Converter for Mac can help you easily convert 2D movies to 3D format, and it supports converting 3D video to standard 2D video formats on Mac. Plus, it can convert 3D video to other types of 3D video with outstanding output quality. This 3D Video Converter for Mac supports several 3D modes - Anaglyph 3D, Side by Side 3D, and Top and Bottom 3D. You can select any one according to your need. Now it supports HTC One X, Samsung Galaxy S4, Samsung Note 4, Kindle Fire HD, iPhone 6s/6s Plus/ 6/6 Plus/5S/5C, iPad mini 3/2 and iPad Air 2, etc. Statement: First, please download the orginal installation package by clicking the download link. Of course you may also download it from the publisher's website. Using Aiseesoft 3D Converter for Mac crack, key, patch, serial number, registration code, keygen is illegal. The download file hosted at publisher website. We do not provide any download link points to Rapidshare, Hotfile, Depositfiles, Mediafire, Filefactory, etc. or obtained from file sharing programs such as Limewire, Kazaa, Imesh, Ares, BearShare, BitTorrent, WinMX etc. Software piracy is theft. If you like Aiseesoft 3D Converter for Mac please buy it.